Creating small reserves of surface water, such as lakes or ponds, and keeping the water from leaking into the soil by making them watertight so that the water can be kept for longer and the population can have a water supply during the dry season. Reservoirs have long been important for farmers – they serve as reservoirs of water for livestock and horses, for washing, and as protection against fires and droughts. As for ponds, they are small, closed-off stores of water that often dry up in the dry season. Creating reservoirs or ponds is a simple way to conserve rainwater and provides a nearby store of water that can be used for various needs. It is one way to reduce the difficulties faced during the dry season. Creating reserves of surface water mostly concerns people in rural areas, but they can also be created in suburban areas or close to urban areas provided that there is sufficient land. These sorts of water reserves are particularly useful in areas where rainfall is irregular throughout the year. In the wet season, the reservoirs or ponds fill up. In the dry period they become a nearby source of water that can be used to water livestock, for washing, for cooking and cleaning, and in some cases, depending on the construction, for drinking water. 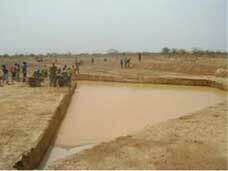 The first step in constructing a reservoir or a pond is choosing a place for it. It is important that this be a place with plenty of sunshine because this is necessary for photosynthesis and healthy oxygen-producing plants. The pond should therefore have a Southern exposure. It is also important to include a fairly tall stand of aquatic plants to the south of the pond so that the water does not get too hot in the summer. Also, trees should not be planted too near the edges of the pond. The shade it creates and its falling leaves will increase the amount of organic matter in the pond and can destroy its biological balance. In addition to that, the roots of the tree can make the pond not watertight. Remember to keep a minimum distance of 3 or 4 metres to the north for example if the wind comes from the south, or only plant small evergreen shrubs near the pond. 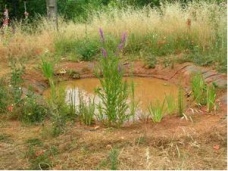 To keep rainwater or runoff water from bringing sediment into the pond, it is recommended that you plant the banks with grasses or other low-growing plants. The reservoir can be filled either with rainwater, by collecting water from a non-polluted source during the dry season or, a solution that is common in some regions, during floods. In this last case, and especially if the water will be used for drinking water, it is important to build a dike measuring 50cm to 1 m high around the pond so that it does not fill up with the first flood water, which usually has a large amount of material deposits in it. Finally, if the pond is close to the water table, there can be an exchange between these two bodies of water and it will be necessary to make the bottom of the pond watertight. Then it is important to choose the right material to make sure that the bottom of the pond will be watertight. Clay is a natural, ecological and long-lasting way of doing that. This is the oldest way of making a pond water-tight. It should be applied in a compact layer measuring 20-30 cm thick. It can be difficult to apply and it may be damaged by rodents or by the roots of trees. A PVC tarp laid on the bottom of the pond can fulfil the same role. PVC tarps are reasonably priced, easy to install and resist freezing, but they are more easily broken, not very attractive and make it difficult to plant vegetation because there is nothing for the plants to grow in. They do not stand up to rocks or to rodents who burrow when making their nests. In place of PVC, buytl rubber can be used ; it has the same advantages and it is also more resistant, but the cost is higher. - the result is not very attractive. Lastly, the bottom of the pond needs to be covered with a 5-10 cm deep layer of sand to allow plants to grow. The reservoir may only be full of water during part of the year, because of a lack of rain or because of evaporation. This should not be seen as a failure – it provides a rich source of biodiversity. Also during the first few years, the water in the pond may be very muddy or may suffer from algae invasions. It can take sometimes 2 or 3 years for the biological balance in the pond to establish itself. In this case, it’s important to not let plants such as algae take over the pond, to remove dead leaves and if necessary, clean out the organic matter that has settled in the water. Reservoirs and ponds are important sources of nearby water that can be used for various needs, and they provide an important safety margin, particularly for livestock and for water for washing during the dry season. They are also a source of biological diversity in the environment. However, there is no guarantee that they will always have water, and they require some basic maintenance. The cost of a reservoir or pond is low, especially if there is a cheap, local supply of clay. PVC tarps can be found for around €7/m2. It is recommended that a reservoir should be at least 80cm to 1 m deep to provide enough water ; the banks of the pond should not be too steep. A slope of 10 to 20% is gentle enough that any wild or domestic animals that fall into the pond can easily climb out. The pond should be constructed to include areas of different depths (15 to 20 centimetres, 30-40 centimetres and 80 centimetres and more) so that different aquatic plants can grow. 10) Where to obtain further information ? 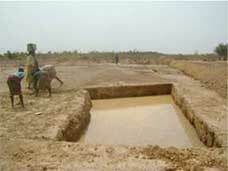 - SOS Enfants : « Aménagement de mares dans une ferme pilote au Burkina-Faso » (“Constructing a pond on a model farm in Burkina Faso”).